I’m a frustrated homemaker. Have been all my married life and – dear heaven – that’s a damn l-o-n-g time! This morning I made the bed. I sometimes don’t bother to do a proper job of it and I know many of you don’t either. So don’t get all judgemental! LOL! I brought out clean towels for the bathrooms and admired my handiwork with a contented smile on my face. Those who know me well will know that I have not had much time in recent years to do these little tasks; the current domestic worker usually did that for me. Getting back to the green. 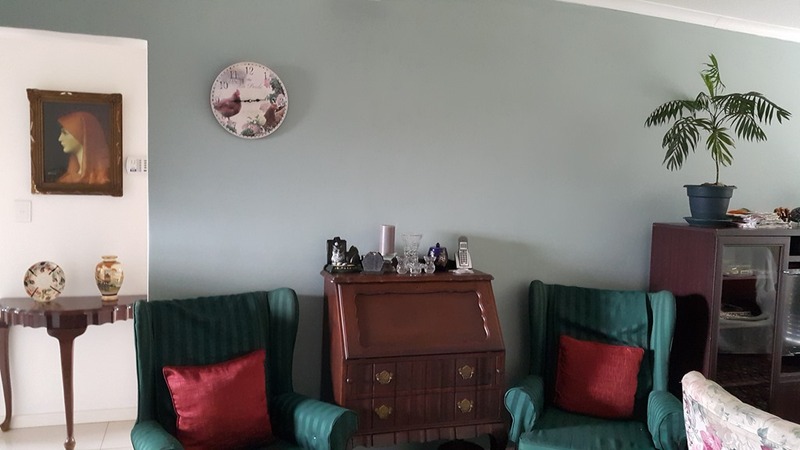 My immediate family were taken aback by my decision to replace the dirty beige colour on single feature walls in 4 rooms with a muted green that I love. The risky behaviour on my part has been rewarded, IMHO. The pic shows the work-in-progress in our bedroom. Antique pictures will hang above the bed; I’ve just got to research which box they are packed in! Our single garage is still packed full of unopened boxes and I am only allowing one box at a time into the house for unpacking and *further* donations to local worthy causes….. The duvet cover will be replaced by a new cover in white or very pale cream made by yours truly. Just don’t ask me when! 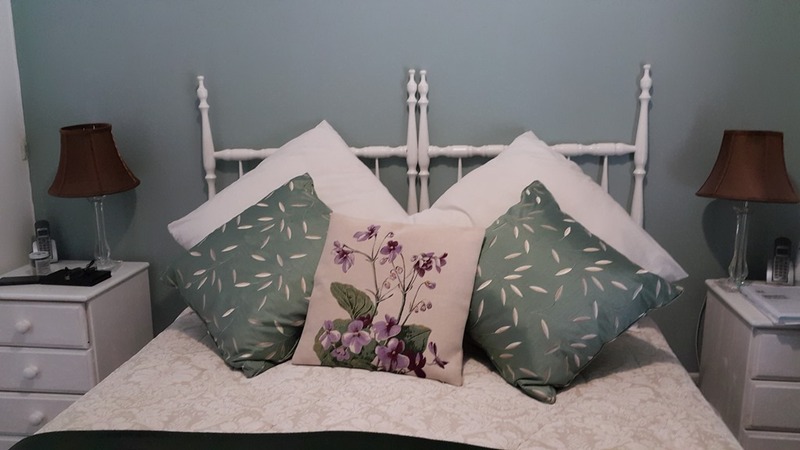 The floral tapestry cushion was bought with a substantial outlay of Euros in France! Once again, the greens tone in beautifully with the other greens in the small room. The second picture shows part of the feature wall in the living room – a definite work-in-progress. The stuff dumped on the writing bureau will be replaced by a nice lamp and a jacaranda wood framed circular mirror made by John Early of Dargle in KZN will hang above it. As you may have already deduced, I am really enjoying feathering my new little nest! I wrote earlier today about a new Banting book out in South Africa. 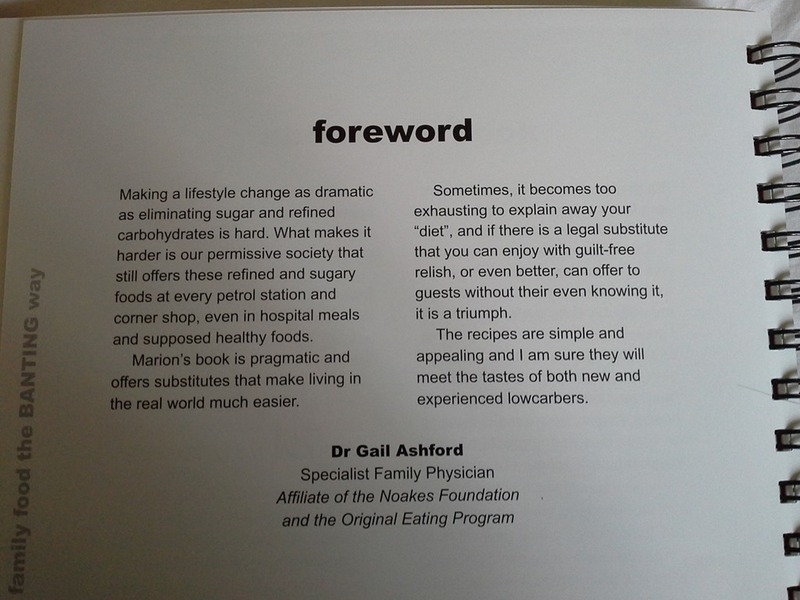 In the foreword to this book, Dr Gail Ashford writes about the difficulties encountered in the lifestyle changes and challenges that 100% Banting imposes on us. Hopefully neither Dr Ashford nor Marion Makepeace will object to me quoting the foreword here on my little blog. 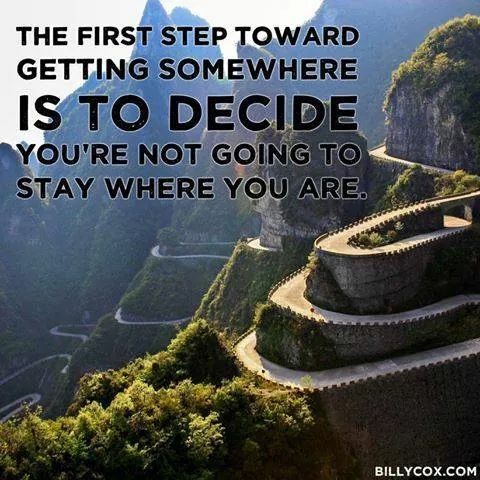 These are the challenges I wrestle with every day and I am learning to take my progress day by day. To look at the next 5kg loss and improving health markers & not the final destination of this odyssey. As they say, even if you walk slowly you’re still lapping the guy on the couch! #2015HereICome … Sunday morning weigh-in showdown! For years, I have logged my weight first thing on a Sunday morning. I do sometimes weigh in during the week as well but it’s probably not a good thing to do if the results checked on a daily basis are likely to throw one off course. Readers who honour me by subscribing to this blog will know that my Odyssey has been a ‘mixed bag’ of a spectacular (if I say so myself!) success of 25kg lost and then a stumbling, erratic climb in weight. All indications are that the fancy shmancy scale will show that I have regained everything plus more this morning. Hating to disclose that! The reasons for losing my way on the Odyssey are legion and would fill a dozen posts. I will spare you all that pain! Nothing in this world can take the place of persistence. Talent will not; nothing is more common that unsuccessful people with talent. Genius will not; unrewarded genius is almost a proverb. Education will not; the world is full of educated derelicts. Persistence and determination alone are omnipotent. So, it’s Boxing Day and dear spouse (henceforth to be known as WJJ) is sitting, chilling and watching the first day of the SA/West Indies test at St George’s Park, Port Elizabeth. A rude interruption from me rolling in a very dusty “Big Blue Ball” (BBB). 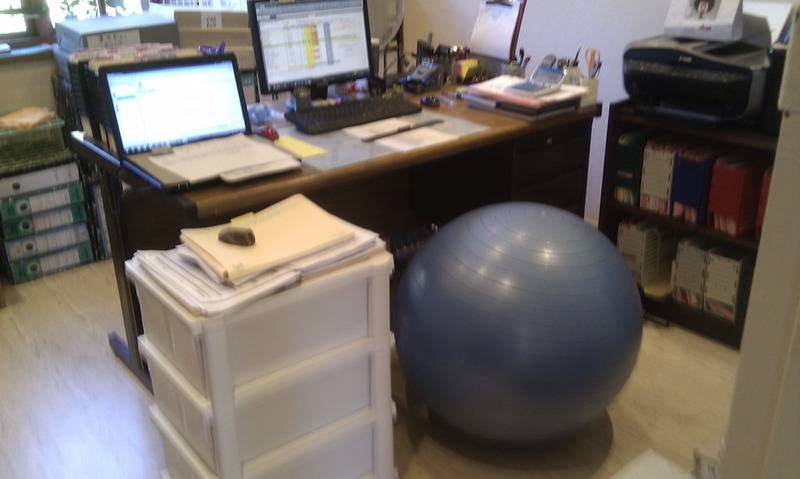 A couple of years ago, I used this ball as my office chair and I still have the pictures to prove it! 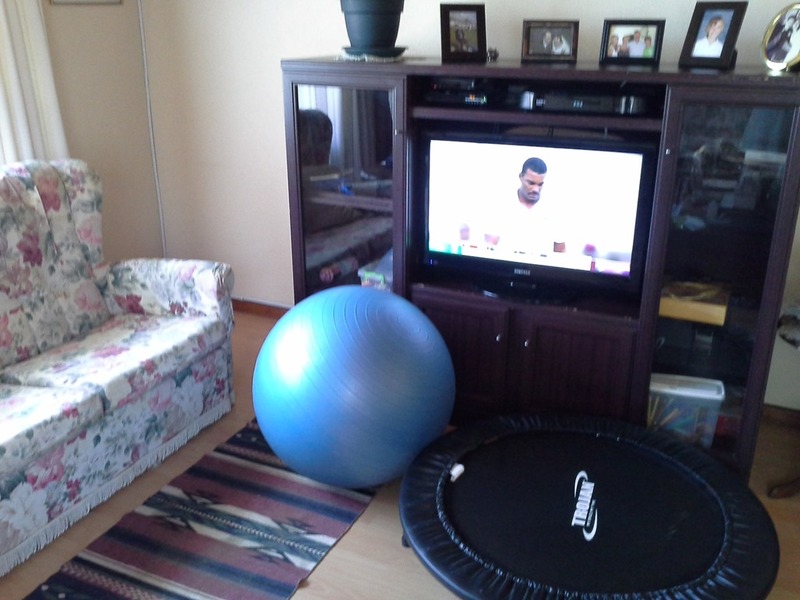 Also lugged into our living room is the “mini trampoline” or rebounder as they are also called. WJJ’s face was a picture! My plan is for us to sit on the BBB for ever-increasing periods while watching DSTV. A sort of penance for watching our favourite channels?! LOL I am an “app’ addict and have a great timer on my phone and my tablet. I will monitor the planned increasing times spent on these very basic exercise resources. The rebounder is also an excellent beginner resource to start us off walking on the flexible surface. I know from experience that my dormant calf muscles protest quite ferociously if I just walk. 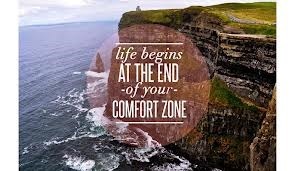 Obviously, we will not be bouncing around wildly and injuring ourselves bouncing right off the darn thing! Also hidden in my Dad’s old tool box, which we use as a coffee table in this room, are some hand weights and stretch bands. But that will be a story for another day!